Times: Safe solar observing; 5:00 PM – Night sky observing; approximately 7:00 PM (Weather Permitting for observing). Planetarium Presentations will occur rain or shine. There will be safe observing of the Sun before sunset through the 4” Lunt Hydrogen Alpha telescope. After dusk come and observe the wonders of the night sky. Planets observed may include views of Saturn with its rings. Many deep sky objects may also be observed such as the Ring Nebula and other nebulae, clusters and double stars. 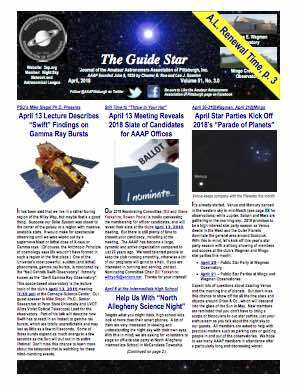 Presentations about current events in astronomy and the Mingo Creek Park night sky will take place in the Richard Y. Haddad Planetarium at various times throughout the night. In preparation for Halloween we may have some visitors from a galaxy far, far away.